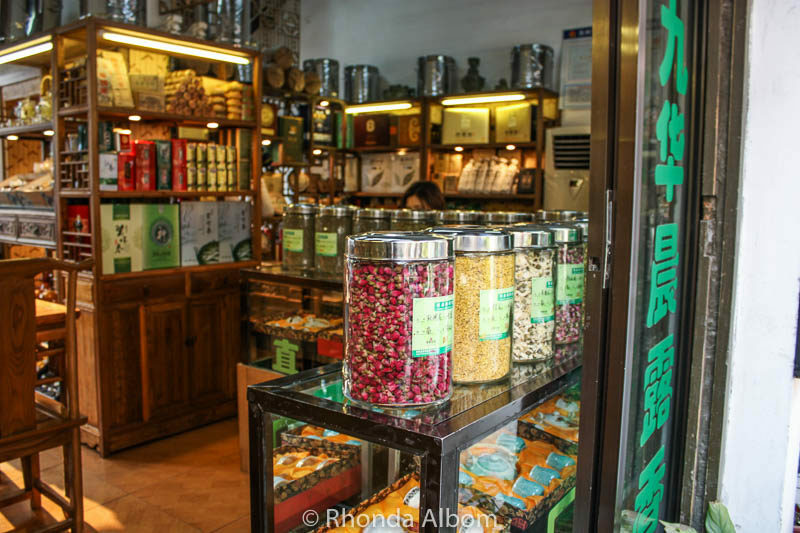 With just one day to visit, we only got a glimpse of life in Suzhou China. Sitting about 100km west of the big city of Shanghai, we could sense the more relaxed lifestyle the instant we got off the train. Life in Suzhou had an almost tranquil atmosphere despite being one of China’s most affluent cities. A zig-zag bridge in one of the many Suzhou gardens. Once inside, life in Suzhou seems entirely peaceful. Suzhou is a beautiful city on a canal most known for its several UNESCO world heritage gardens. Notice the woman on the steps washing out her mop in one of the many house lined canals. This woman is making an offering at a Buddhist Temple. Motorbikes, pedalled bikes, and pedestrians share the narrow streets in the Pingjiang historic quarter. 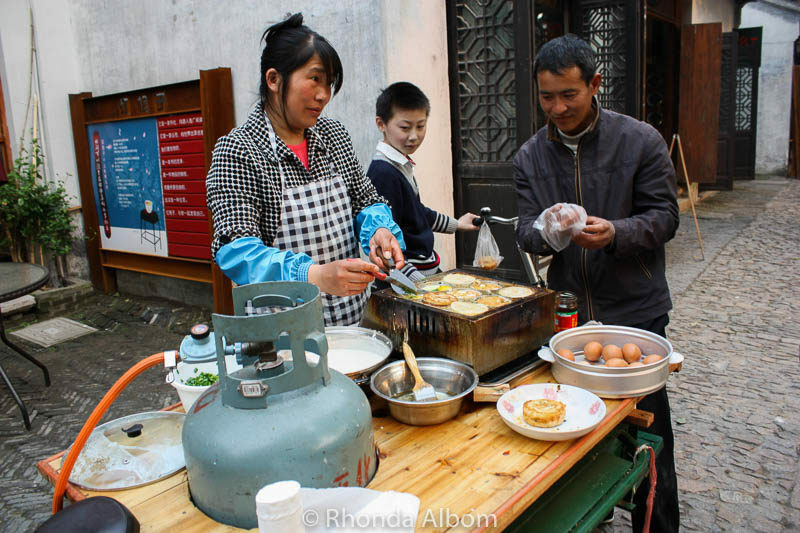 Street food was readily available in Pingjiang. Looking into the kitchen of a restaurant specializing in Peking duck. 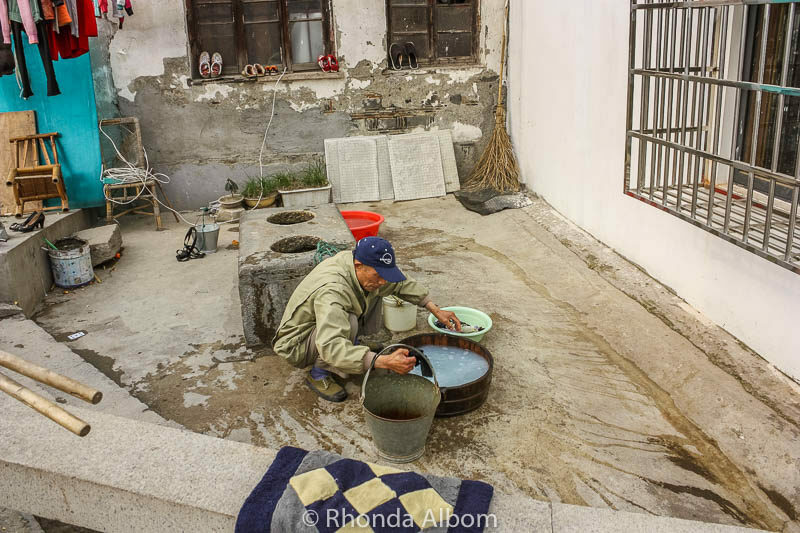 Leaving the main streets and tourist areas, we see a slightly different side of the city, like this man washing laundry at a well. A street view of Suzhou shot from the moving car. 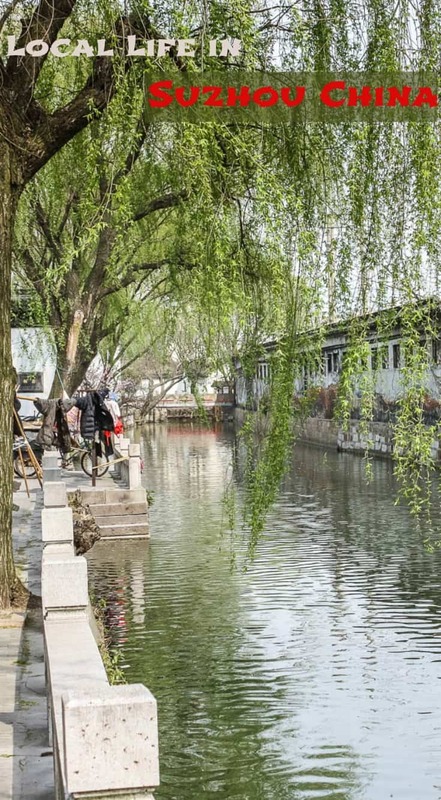 The many beautiful canals in Suzhou leave some people reminiscent of Venice Italy. 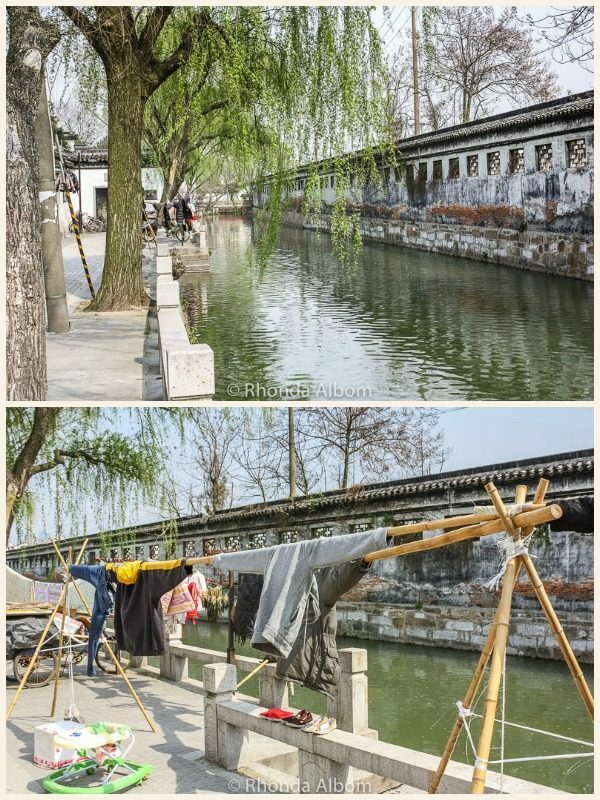 The second photo is a closer look at the laundry hanging on bamboo poles. The couple sitting to the left in the photo are eating chicken feet and spitting the little bones onto the ground (this is traditionally how it’s done). Another area of speciality is silk. 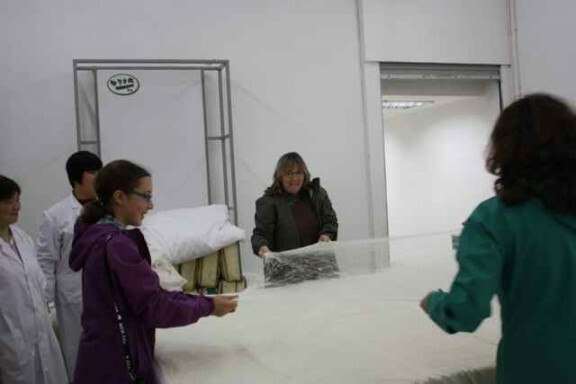 We saw the entire process from silkworm through a blanket and even had a chance to help stretch one of the 100 layers of silk inside a blanket. We travelled from Shanghai to Suzhou via the bullet train. They are the world’s fastest trains and the easiest way to get to Suzhou. The trip from Shanghai took only about 30 minutes. Outside the Suzhou train station, we were able to find a taxi, and we opted to negotiate and hire a driver for the day. We had the advantage of travelling with a friend who is fluent in Mandarin Chinese. 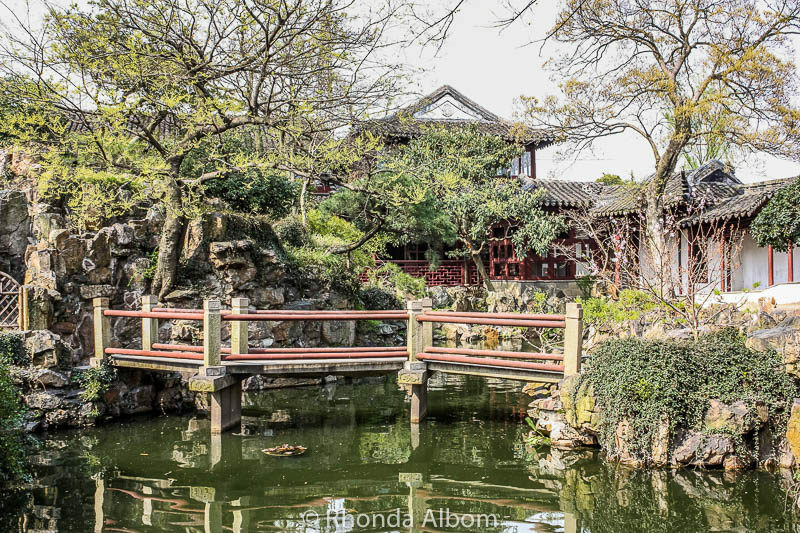 Be sure to visit one of the classical gardens of Suzhou. Enjoy a flavorful meal here. Famous for its Jiangsu style of cuisine, it is healthy and delicious food originally prepared for the aristocracy. There are many options to cruise down one of the beautiful canals. The boat we selected started from the garden and included a serenade as we gently paddled through the waterways. After the gardens, a visit to the silk factory tops our list of Suzhou attractions. Have you been to China? 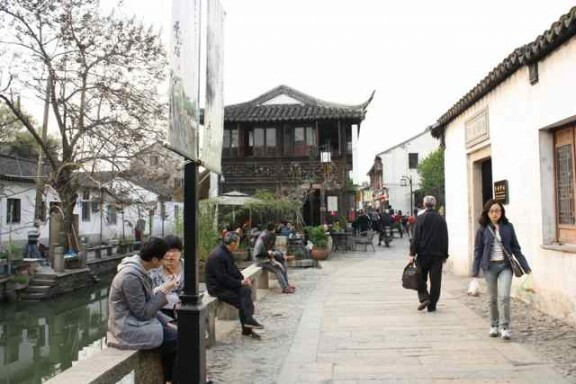 Did you get a chance to observe life in Suzhou? Thanks so much for your useful and informative post! 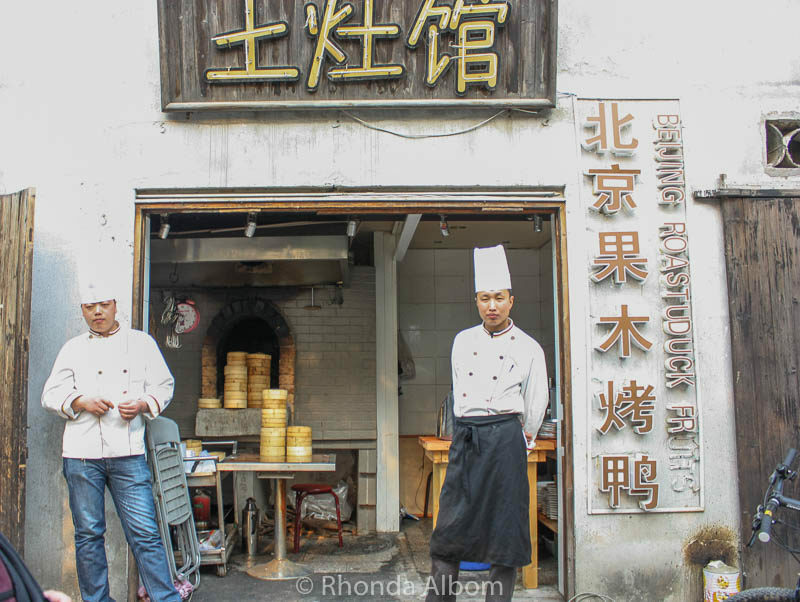 I really like your authentic photos that take the daily life of the Suzhou locals. It seems that this small town has not been commercialized. My name is Mark Lent and I live and work in Suzhou and teach photography at Xi’an Jiaotong-Liverpool University in the SIP. Would love to talk to you about speaking with my students next semester and maybe taking them on a shoot. If this would interest you, you can contact me at the e-mail I am providing. My husband and I visited Suzhou last May during a trip to China. We took a cruise down the canal and walked through the marketplace. Amazing! The bridges definitely reminded us of bridges in Venice. It’s probable that Marco Polo was inspired while trading for silk during his visits in the 1200s and took the design back to Italy. For us it was an educational tourist experience. For the locals it was just another day on the canal. So you know what a special place Suzhou is. It’s nice to see it through the eyes of visitors, so we can really appreciate it. China and it’s many wonders are on our travel-to-do list.. 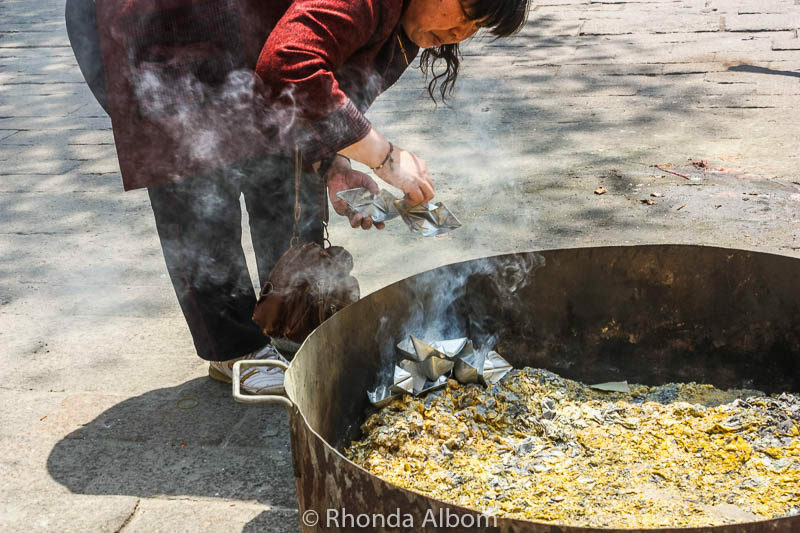 Looking at Suzhou through your camera was a fascinating peek indeed – thank you! And thanks for your comment on my travel photos! It was other blogs that encouraged me to add them. We all help each other. Great photos. I found China to be very interesting. It was the first Asian country that I had visited. Japan is very different than all the other Asian countries I have gone to. I was really impressed with how clean and orderly it is. The food here was incredible. Thank you for stopping by. We all found China interesting too, and yes loved the food. Especially the hot pot we learned how to properly eat while in the Szechuan province. I would love to go to China one day and experience the bullet trains! Suzhou looks very peaceful from your photos and indeed the canals remind me of Venice. I love the photos with local people on it. It gives the photos so much meaning. Thanks Kreete, that was my goal of the photos. Thanks Paula, that is our goal. That first photo and the one in your Pinterest photo are very scenic. I would have guessed that it was merely part of some large park, not an integral part of Suzhou if you had not told me. The daily life photos remind me of Penang, Malaysia in some ways, probably because of all the Chinese influence there. It is in an interesting town worth an exploration. What an amazing post! Each photo more special and unique than the other. The very first one, of the lady on the steps by the canal felt so personal, that I had to go through every single one of them. I felt as if I was there. wow, thanks Pedro. I am glad you enjoyed my photos. We were just talking about going to Hong Kong and Macau. I hope you love them both. Loving your throw back posts as you slowly make your way through your archived photos … Suzhou looks like quite the charming and peaceful place, and I love that there are UNESCO world heritage gardens to explore! Thansk Megan, there are more to come. I really liked your photos. Suzhou is a place that i have heard but never been. It seems so unique, calm… Beautiful place. It is both calm and beautiful. I like when people write this kind of posts. It’s just unbelievable to think how easy is to get off the path, even in places that receive a lot of tourists. You just need to get out of the main street and suddenly, you’ll find yourself immersed in the everyday local life. I love the picture of the man doing laundry by the way. I think I’ve never seen this in a developing country. Thanks Joan. We try to get off the beaten path as often as we can. Id love to visit Shanghai and planning to do it in March! so I really like to see the pictures for a day trip to this town that we probably do. My plan is to stay four days in Shanghai. Any other recommendations, trips that we could do? What an interesting and photogenic city. Such a short trip on the bullet train makes it’s very achievable for independent travellers who prefer not to do an organised tour although the boat on the canal sounds like a must do experience. There are many options for taking a boat on the canal. We actually took a boat from inside the garden. LOL – I use a bucket to rinse the mop. Love the photos! Thanks for hosting!! This is the kind of place I want to visit when we get to China in June. The big, busy cities are not my choice over these really pretty and authentic places. It’s an easy day trip from Shanghai. Take the fast train and it will save you an hour on the return. We took our children when they were already teens. I am not sure they would have liked the crowds in some of the bigger cities when they were young, but they enjoyed all that we visited as teens. This is the kind of place I love. A little unheard of, out of the big cities, and where you can see real life. Loved the man washing his clothes. THis to me is a real sign of village authenticity. Agreed. We love to get off the beaten path and find the real life in a city. Meeting and communicating with the people is how we really discover what a town is really like. The Suzhou Museum is one place we didn’t visit. There is so much to see everywhere. Lovely glimpses of life in Suzhou. Thanks Ahila, that’s what I strived to do. I’ve heard of Suzhou, but never been. I’ve heard of how pretty it is, and your photos definitely do make it look that way! It’s the gardens that really make it so lovely. I know I only shared one garden here, as I wanted to show the essence of the city. oh the river looks like a lovely scenic spot. A great collection of pictures which seem to really capture the essence of the place. We have yet to visit China and it was good to see the day to day life in a traditional Chinese town away from the big cities. 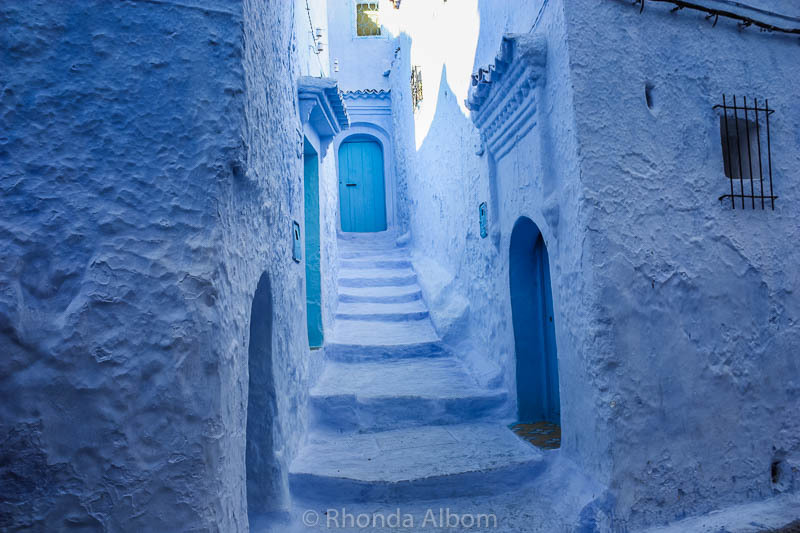 Very different, yet interesting approach to sharing a destination Rhonda – I like it! 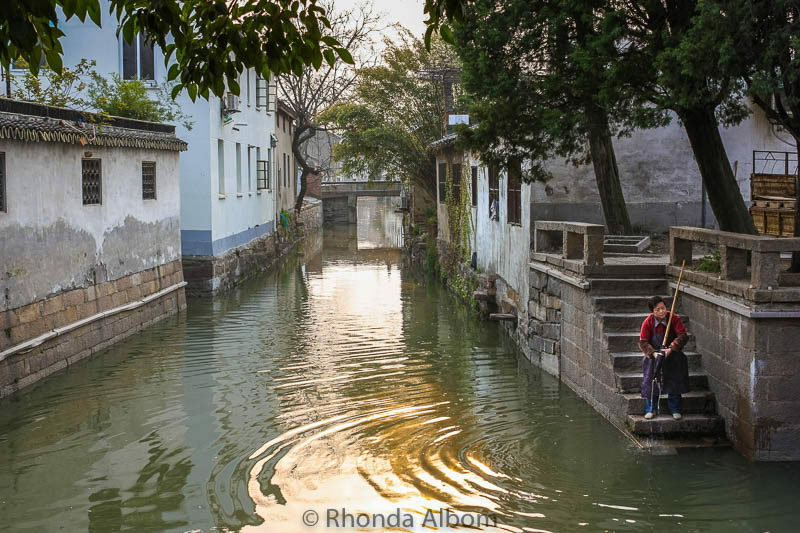 Your photos do help convey what life is like for people in Suzhou but also show what the city looks like. I’ve yet to visit China so I always like to get glimpses of what it is like. Thanks David. We always try to step off the beaten path. I am glad you enjoyed it. We didn’t make it to Suzhou when we were in China. We thought about it but instead went to nearby Hangzhou, home of the West Lake, where we had friends. Next time, I want to go to Suzhou and try the Jiangsu style of cuisine. I think Hangzhou is more popular. We chose Suzhou on the recommendation of a friend who lives in Shanghai. It’s an easy trip from Shanghai. We do try to do this as much as possible. Was it really 4+ years ago? In many ways it seems like yesterday. What beautiful photos you have of Suzhou. I enjoyed seeing them! I can’t believe it either. My original post had only tiny photos and only a few of them. It has one of us. What a cool place to visit! We never heard of this place before! Loving the pictures and this is definitely inspiring! We would love to go back to China to visit Suzhou! There are so many interesting cities in China. I could go back for quite a while and still barely see it all. I did love Suzhou, and it was easy to get to. So much fun to see your photos of Suzchou, it allowed me to relive my experience of visiting the canals a few years ago. I also admire your shots in the city outside of the touristy areas. I was on a tour, so I wasn’t able to explore everyday life as much as I wish I had. I have a friend who lives in Shanghai and she took us to Suzhou. She speaks the language and hired a driver she knew, so we could go exactly where Elyn wanted to take us. China is such a fascinating place, I hope to get there someday. I love the pictures you took in Suzhou. You always capture the atmosphere of the place you photograph. Remember to take the bullet train to get there. It takes only about 30 minutes, compared to an hour on other trains. so many amazing pictures – you’ve been to so many places! i love seeing the world through your eyes – gorgeous and true life. Also enjoyed the desert and blue city photos and that above ground graveyard in Spain. Wild! Thanks for always supporting me – and sharing the world with me!! I’ve not been to China. I know this doesn’t surprise you. You’re the traveler. I’m the stay at home kind of gal. Okay, I’m the boating kind of gal. I would have loved seeing all this in person. LOL – true, but this town does have a boating element to it. Lovely – especially the canals. Glad you are rediscovering your travels! The canals were a bit magical. 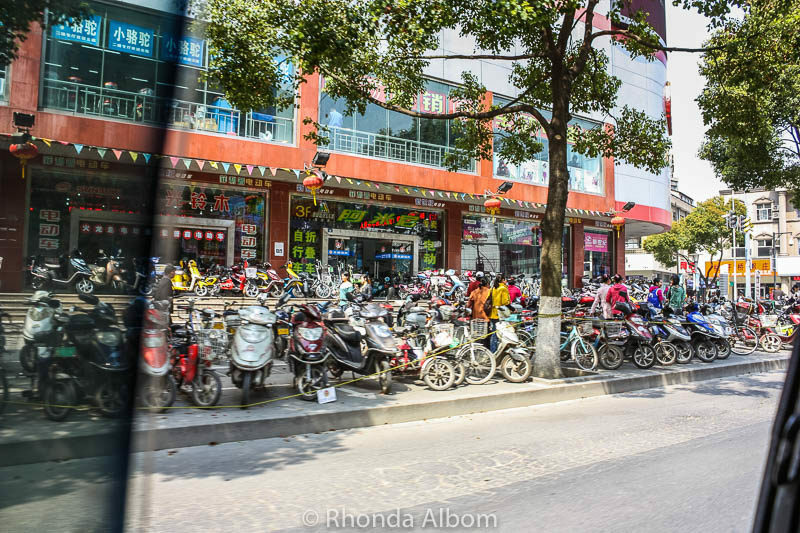 I love your glimpse into everyday life – sometimes hitting all the tourist “high spots” you don’t get to see the people on motorbikes heading to work, or eating street food. Lovely. We make an effort to get off the beaten path when ever we can. Inside the Chinese Gardens is another world. You walk through the gates into pristine tranquillity. Not sure I’d want to wash my clothes in that canal. And wow, so many mopeds. The man was using water from the well. I am not sure what water was used on the clothes hanging at the canal. And as for the mopeds, that’s why I snapped the shot. 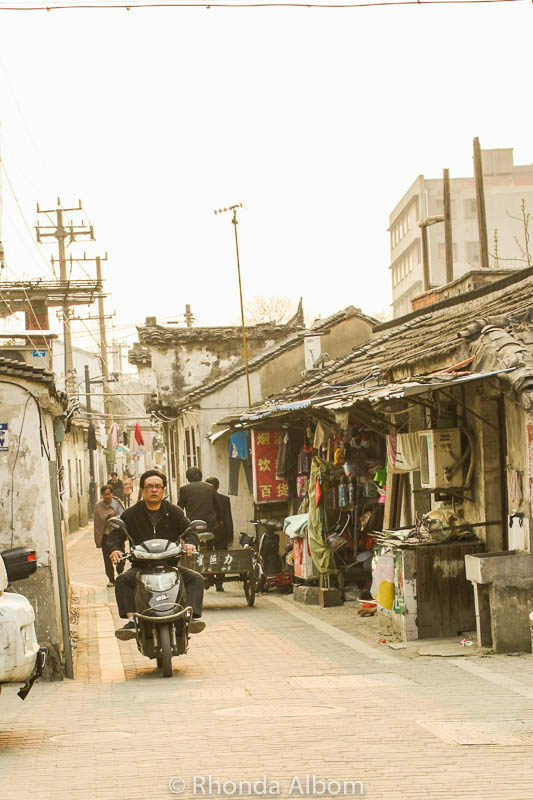 The photos are beautiful and really gave us a glimpse into everyday life in Suzhou. I haven’t heard of it before but I love the idea of a boat tour through the canals and being serenaded. What a memorable experience with the silk process. We spent about 4 days in Shanghai and one in Suzhou. Not enough, but I always say that. There is so much to see it China, it is hard to pick where to go. Suzhou is a wonderful day trip from Shanghai. If i had it on me.. I probably would have spent 100 dollars in that tea shop lol… and I already have more than enough here so far and there’s a teavana near the medical building my doctors are at! I am more of a coffee drinker, but either way, I wouldn’t want to ever run out of tea. I love your photos. You have a way of making me feel as though I’m there. I love the little details of every day life that you include. Excellent. That is my goal. That’s one way to get your washing done! 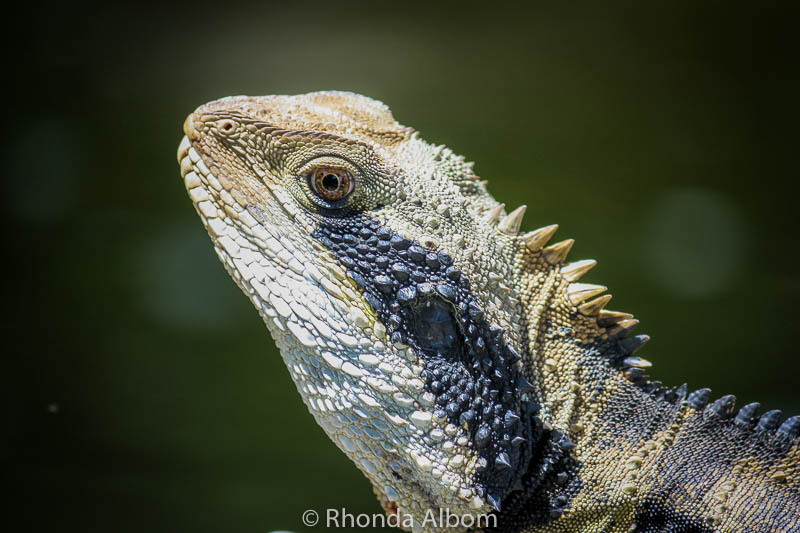 I love your photos, especially the one taken out of the moving car – you’ve got a steady hand! And the rest of your trip sounds lovely, especially seeing the silk being made into a blanket. Thanks Kat. I have always been told I have a steady hand. Another secret for shooting out a window – super fast shutter speed.